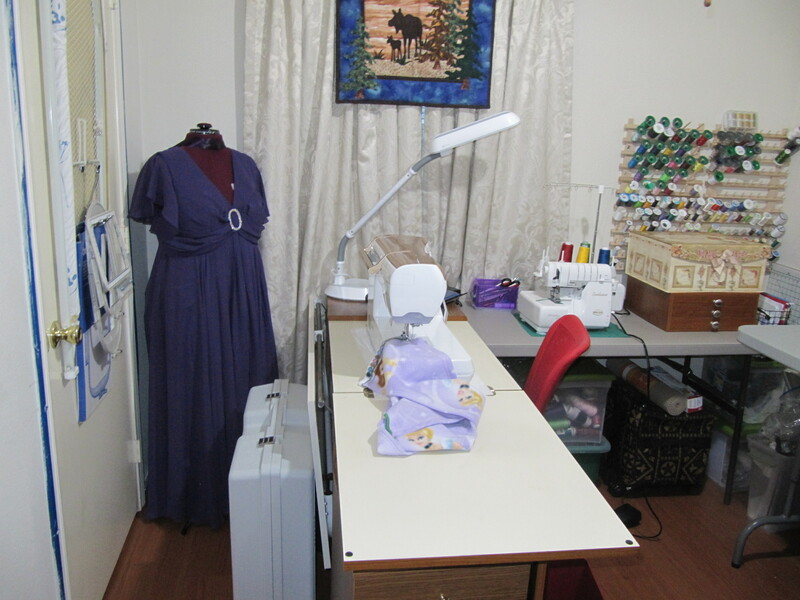 Okay, they’re out of the boxes and the sewing room is changing every day. I sold another serger today so I only have one more to sell and it’s posted everywhere I could think of. It’s now packed away in that black and gold rolling case on the lower right of this picture. Can’t wait to gain back that space as well. Before long I’ll actually be able to create something in there instead of buying, selling and reorganizing. Today was a day of errands, deliveries and friends. I went to the Before Inventory sale at my local fabric shop and bought 16 spools of embroidery thread in colors that I was lacking. It seemed as though I had colors for children and floral designs but no browns for animal prints. The design I test-stitched for a shirt for Ronnie the other day (81700 stitches!) should have been shades of brown with it’s 22 thread changes but it ended up very gold, beige and gray. Not good. Since I intend to stitch dog prints for our dogs (and maybe to donate) I’m sure to use some of those hues I purchased today. (Let me at ’em!!!!!!!!) I’m actually going to do an inventory tonight and go back for more thread tomorrow….and this was sanctioned by my dear husband. He thought the price sounded right, too. I’m so glad he’s so agreeable. Tomorrow is more errands and laundry that I didn’t get to today, but I hope I have time to sew tomorrow. I want to try an embroidery design. The embroidery attachment and all the hoops are in that gray, molded-plastic case on the bottom left and have yet to be unpacked. We actually had to take pictures of the inside of the case (at the dealer’s urging) because there is no diagram of how to put it all back in the case once it’s removed. The dealer said he suggests that all his customers take pictures before unpacking and has seen ladies use their cellphones to photograph them prior to starting a class. Isn’t that strange? Tonight I’ll start going through the books for the machines and inventory my embroidery thread. My assignment is to read every word of the books and watch all the movies (the Ellisimo has movies on it that explain how to do things in case you get stumped), then to try all the stitches about which I’m comfortable. If I get stumped after that my instructions are: 1) rethread the top and bottom threads, 2) reread that section of the manual, 3) rethread once more, and 4) go get a glass of wine and walk around for a bit. If I am still stuck I then can call for help. LOL I really love number four!